The new APM Terminals’ platform in Vado, which is currently under construction in the northern Italy, will boast an annual capacity of 1.1 mln TEU, channel depths from 16m to 23m and the productivity of 26 movements per crane per hour, announced Paolo Cornetto, CEO of APM Terminals in Italy, at the 5th MED Ports 2017 exhibition and conference in Barcelona last week. The Port of Vado is located in the region of Savona on the Ligurian Coast, near Genoa, Italy’s busiest container import/export port. APM Terminals (APMT) develops here the new 800,000 TEU capacity semi-automated container terminal, the first of the kind in Italy, able to accommodate container vessels of up to 19,000 TEU capacity, scheduled to become operational in 2018, and a Reefer Terminal. 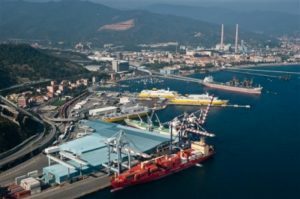 In 2015 APMT purchased the existing Vado Ligure Reefer Terminal, with an annual capacity of 275,000 TEU, one of the largest reefer facility on the Mediterranean Sea, in particular accounting for 60% of this traffic in the ports of the Ligurian and Tyrrhenian Seas. Apart from regular container traffic, APMT Vado platform is intended to handle project cargo (industrial equipment, industrial components and infrastructure) and temperature-controlled fruit volumes, the facility’s traditional traffic. These operations will be carried out at the Reefer Terminal, which is equipped with a berth for possible freight ferry traffic. Talking about the fruit traffic, Paolo Cornetto has told about a freight train for temperature-controlled cargo, which APMT launched from Barcelona to the Zaragoza freight village in Spain. Now the company plans to introduce this business model in Italy. The terminal’s intermodal objective is ambitious: 40% of freight to enter and exit by train. Just to compare, the port of La Spezia’s indicator is at 36%, Genoa’s at 18%. The port of Genoa’s freight train operator FuoriMuro offers rail services from Genoa, La Spezia and Livorno to major destinations in the northern Italy and has recently launched a service between Marseille and Parma that calls at Vado Ligure. According to Paolo Cornetto, the trains that will depart from Vado new rail terminal will be 450m long, with the option of being attached to longer convoys at the intermodal centres of the Po River Valley. As we wrote earlier, in 2016 APMT was joined by two Chinese partners in the Vado project. COSCO Shipping Ports now has a 40% share and Qingdao Port International Development Co., Ltd a 9.9% share in both Vado Reefer Terminal and in APMT Vado Container Terminal. APMT remains the majority shareholder (50.1%). The deal was closed in March, 2017.